Home > Blog > Health Conditions > New Research: Does Neutering Help With Aggression? Most pet owners have undoubtedly heard the following statement at some point in their lives: Fixing your dog will make him less aggressive. It’s an idea so often restated – even by veterinarians – that many of us accept it as undeniable fact. But is it? Does neutering help with aggression? Some recent studies say no. In fact, a new study released earlier this year found mostly negative behaviors in neutered male dogs. Rather than reduced aggression, the neutered male dogs in the study were found more likely to show aggression when strangers such as delivery workers were near the home, when the dog was approached by an unknown female dog and when small animals entered the yard. The study also found that the behaviors were worse in dogs that were neutered earlier. The neutered dogs also demonstrated more fear-based behaviors like reactions to loud noises and new situations. Intact dogs were less likely to eat feces – either their own or another dog’s. They were also less likely to roll in feces or other smelly things. Intact dogs were also less likely to bark persistently when they became alarmed. Intact dogs were less likely to mount objects, furniture or people. Intact dogs were also less likely to chase animals. Are There Any Behavioral Benefits to Neutering? Intact dogs were more likely to howl when left alone than neutered dogs. Intact dogs were more likely to mark indoors. Intact dogs were less likely to return immediately when called while off-leash. Intact dogs were less likely to fetch. [RELATED] Do you even need to spay or neuter your dog? Society may say yes, but you shouldn’t always listen. Why The Need To Neuter? And we’ve heard this before. It’s not a secret that thousands of dogs are euthanized because of over-crowding in shelters. Rescue organizations across the world work hard to find these dogs home, but not all are lucky enough to find one. The problem is, many of those dogs are surrendered to shelters because of undesirable behaviors such as aggression. These dogs end up in the shelter and the push for neutering continues. The current study highlights this issue. 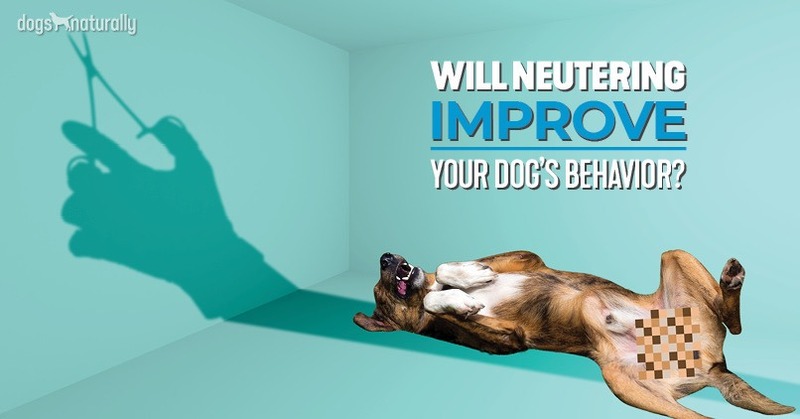 The long-held belief that neutering will help curb aggression coupled with the need to reduce the number of unwanted dogs means people are quick to head to the vet for this procedure. This, the study suggests, can actually increase the problem, in turn making them more vulnerable to ending up in a shelter. [RELATED] Spaying or neutering can have an impact on health as well as behavior. Here are some benefits of waiting. Once again, neutered dogs were found to be easier to train, according to the surveyed owners. We have long supported the need to, at the very least, wait until a dog has fully matured before choosing to spay or neuter. There is a lot of research that supports the health benefits of this approach. Now, thanks to these new studies, we can see there may be behavioral benefits as well.